As I mentioned briefly at the beginning of my post on HFCS last week (thanks to everyone who commented, by the way), I had the good fortune to spend a good deal of the month of October in the north of Portugal. I don't want to blather on about how great it was, or how I almost decided to expatriate given our economic woes at the time — suffice it to say that those two weeks amounted to one of the most awe inspiring experiences of my entire life. I don't use that last phrase lightly; the places I visited and the things I saw were amazing, and wholly unique to my experience... which is why I find it so damned frustrating that, a brief two weeks later, I struggle to remember anything about it! I had grand plans of writing a huge, meandering opus, but now (lucky for you!) I find it hard to remember anything but brief glimpses and vivid flashes. Such is the human mind, I guess; or at least, my wine addled one. Fortunately, thanks to my trusty digital camera and what few synapses are still firing, I have managed to retain a bit of the trip, some of which I hope may be of interest to you guys. Most of the trip was taken up in hiking the country's many hills, and so I found myself unusually, and quite blissfully, in the middle of nowhere. As such, most of my meals were provided by the hosts at whose houses we stayed. Though rarely complicated, these meals were some of the best arguments for locally purchased foods I have ever tasted. Portugal's economy is heavily agricultural, and in the north this is evident in every bit of open space. Breakfasts were universally continental, featuring locally made fruit preserves, delicious fresh baked bread, and cheeses from nearby Spain. Chestnuts also figure heavily into the cuisine — orchards were everywhere, and the nuts found their way into everything, providing texture for rice, stuffing for pork, and flour for cakes. Without question, the highlight of Portuguese cuisine is the fish. Though initially reticent, a couple experiences at Tosca and Obelisk left me a huge fan of grilled sardines. On several occasions in Portugal we were presented with spreads that would put those august institutions to shame, though with admittedly less pomp and circumstance, and a far lower price tag. 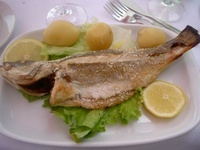 I also had the good fortune to come across the Portuguese speciality robalo ao sal, or, salt-crusted sea bass. As I understand it, the whole fish is treated with olive oil, thoroughly covered with sea salt, and then baked. The result is the most amazingly moist fish I have ever tasted, without the least residual salty flavor. I couldn't begin to tell you how they did it, but there is a recipe on Epicurious, and I definitely plan on trying it out. At the end of our trip, when we reached Porto, Portugal's second largest city, I expected a bevy of cosmopolitan restaurants. Though there were a handful of familiar dining establishments (including a pizza place and a sushi joint), Porto is dominated by cafes. Just as Dublin has pubs and DC has Starbucks, every corner of Porto features one or more small cafes, and though each has its own identity, all were sponsored by a handful of parent corporations. I visited several of these places over the course of my stay, and though I'm loath to generalize, they all shared two things in common: meat pies and Super Bock. The former is easy enough to understand; hell, every western culture has its incarnation, from the saltena to the shepherd's pie. 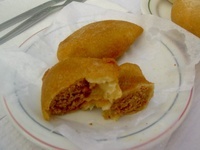 In Portugal, the most common type is the little guy pictured at left: about three ounces of ground pork,wrapped in dough and deep fried, served cold from the display case. For deliciously fatty indulgence, these pies cannot be topped, and I enjoyed dozens while trolling the city, none for more than 75 (Euro)cents a pop! Portugal's cafes' most ubiquitous offering is Super Bock, Portugal's best selling beer. If you think Budweiser has a stranglehold on the US, you have no idea — this beer was literally everywhere, and in most places the only available, draught or otherwise. The basic offering is not unlike your American macro lagers like Miller and Bud, but fuller, and decidedly higher in alcohol, coming in at a healthy 5.3% ABV. In addition to the lager, Super Bock offers up a potable amber, a disagreeable stout, and a bizarre flavored concoction called Super Bock Green, which makes the vile Miller Chilada seem downright tasty. 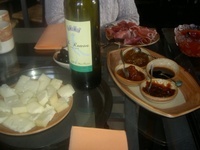 But of course, being in Portugal, my major focus was on wine. Though the nation is all but synonymous with its fortified wine port, it produces a healthy output of quality dry wine — which is a damned good thing for the Portuguese, as there was NO other wine available. Whether in a cafe, restaurant, or wine shop, the ONLY wines available were domestic. I gleaned rather quickly that the Portuguese were a proud and nationalistic people, but I was shocked at the absolute lack of any international alternative, European or otherwise. Were my command of the language anything resembling competent, I would have inquired as to why. Sadly, my combination of broken Spanish and American English wasn't up to the task. Anyhow, to the port! 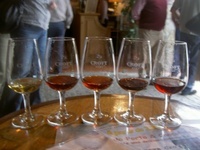 Being a sucker for sweet wines in general, I was already well acquainted with port before my arrival, and figured there wasn't much Porto could show me. How wrong I was! I promise to speak more on port in the future, but for brevity's sake, let me finish now by passing on Portugal's most valuable lesson to me, which is that port comes in many colors, and they are all delicious. Through everyday work experience, I had become well acquainted with tawny and ruby port, and respected each for its merits, all the while writing off white port, the much maligned stepchild. Developed during the Spanish Revolution in the 1930's as an alternative to sherry, white port is relatively young in the history of fortified wine, and I can now say from experience that it has not gotten the recognition it deserves. Treated similarly to your younger tawnies, white port takes all the nutty, oxidative flavors of a tawny port, and places them on a tannin free canvas, offering up all of a tawny's depth of flavor without the weight. White port is huge in Portugal now, with each producer offering up its own branded cocktail of white port and tonic or club soda with a twist. As the last dying embers of warm weather pass us by this coming week, consider picking up a bottle of Fonseca Sirocco or Dow's White Port, and mix it up with a bit of Seagrams and a squeeze of lime; it's the perfect bittersweet cocktail to bid farewell to the last dregs of late afternoon warmth. I plan on having one tomorrow, and hope that it will help me grab another fleeting memory or two out of the ether. With Thanksgiving looming over all our heads and dinner in obscure destinations in most of our futures, (well, Scranton, PA and Wasilla, AK were a little more obscure before the election) it’s time to figure out where we’ll get our crème fraiche. While this French equivalent for sour cream may not be on the top of your list of turkey accoutrements, it should be. Mashed potatoes, butternut squash soup, crudités (I don't think anyone needs a recipe for chopped vegetables) and spicy pumpkin pie all taste better with a dollop of cream fraiche. The problem arises after you’ve fought beltway traffic and arrived in one of those obscure places on the Wednesday night before Thanksgiving, and you’re peering into your grandmother’s refrigerator or local grocer’s freezer – you probably will not find crème fraiche. And if you do, it will cost you. Crème fraiche is significantly more expensive than sour cream or whipped cream. It’s also very easy to make! Mix together buttermilk and cream in a jar. Shake the jar gently until the ingredients are well blended, then remove the lid. Let this mixture sit at room temperature until it has thickened significantly- you’re looking for a texture similar to sour cream. This will take at least 6 hours. You can stir the mixture once or twice to check the consistency. When the mixture has thickened, refrigerate it until served- at least 12 hours. If you don’t have buttermilk on hand (or grandma lives somewhere so obscure that they don’t even have buttermilk) you can substitute with sour cream. Tip: To speed up the process, use room temperature buttermilk and whipping cream. 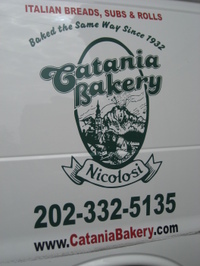 It's hard to think of a business that's been around for more than 75 years as a well-kept secret, but somehow Catania Bakery has managed to stay largely under the radar as the ranks of DC Foodies have continued to grow. Maybe it's the location, or maybe the fact that the lion's share of their baked goods go to restaurants who fail to credit their source, but a search for them online reveals their website, a quick note about their croissants from the Post and a few neighborhood blogs that have posted about their baked goods. You really won't find the profusion of coverage that you might expect about a place that has served the community since 1932. Though you've probably never visited Catania's actual shop, there's a good chance you've tasted some of their goods. If you've ever eaten a sandwich from A. Litteri or Mangialardo & Sons on Capitol Hill, or if you've tried the biscotti at one of several Italian restaurants throughout the city, then you've had Catania. This is authentic baking, and it stands in stark contrast to the national chains' offerings in terms of crumb, crust and taste. With restaurant sales providing their bread and butter, you might think they would be too busy to sell directly to the community. But Catania Bakery continues the traditional retail aspect of the business that the Caruso family started back in the day, opening at 6 AM on Saturday mornings to sell pastries, croissants and muffins in addition to their biscotti and breads. The smell of fresh baked bread and rich, buttery croissants draws you in from the street, reassuring you that you've found this out-of-the-way gem. Walking in the door, you'll likely find yourself greeted by a friendly face. It may even be Nicole Tramonte, who bought the business from the Carusos back in 1978. She has run the bakery for the past thirty years, building up their restaurant clientele without forgetting the neighborhood. Take the time to chat with whomever greets you and you'll learn plenty about the baked goods piled in front of you. 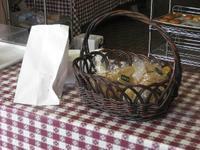 If you're in the mood for something sweet, try a pastry or pick up a bag of biscotti for snacking. But if you're looking for quintessential Italian bread, complete with a dusting of semolina flour that rubs off in your hands, you'll need to get there early. Once supplies are gone, that's all for the week. Call it a reward for getting an early start to your weekend! Getting to Catania is easier said than done, but it's well worth the trip. 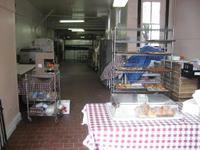 The bakery is still located in its historic home at 1404 North Capitol Street, which is on the south-bound side of North Capitol just before you come to New York Avenue. If you're coming by Metro, your best bet is to take the Red Line to New York Avenue and then walk along New York until you reach North Capitol. If you're driving, do yourself a favor and take Florida Avenue to North Capitol and then head south, making sure to stay to the right as you approach the point where the North Capitol passes under New York. Look for the sign in the window and another across the entrance to the building next door, and then head for the open door between them. 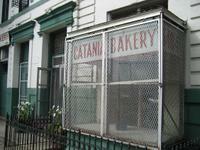 Catania's fresh baked goods are delicious, bringing back memories of growing up at the Jersey Shore. They may not have access to the water that New Yorkers and Philadelphians swear give such distinctive tastes to their local breads, but it seems that Catania's has been doing something right for three quarters of a century. Their low prices are an added bonus - you can walk out of Catania's with a half-dozen pastries, a bag of biscotti and a loaf of crusty Italian bread for less than ten dollars. Good luck pulling that off at one of their competitors with locations throughout the city (or the country). One word of caution before you go rushing out this weekend - call ahead to make sure they'll be open. Unfortunately, Catania's was robbed (again) this past weekend and could not open last Saturday. Hopefully they'll have everything squared away in time for this weekend, but there aren't a lot of other options in the neighborhood if you show up and find them closed. While picking up a few things at Eastern Market the other day I noticed that the guys at Southern Maryland Seafood had whole octopus on sale. Now, I imagine that most folks would consider this little more than a curiosity and turn their attention to the beautiful whole red snapper, the piles of shrimp or the fat sea scallops sharing space in the refrigerator case. Not me. The octopus got me. I was inspired. I’ve eaten octopus a few times. It’s popular among Greeks, who’ve been cooking it since Zeus was chasing skirts around Olympus. But for those of us who aren’t Greek and didn’t grow up in Greece, the octopus is something to see at the aquarium, not toss on the grill. That’s why I bought one. If the Greeks have been cooking octopus for a couple millennia, surely I could figure out how to grill it. And because I love all things burrito and taco, I decided the best way to serve it was in warm flour taco shells with tzatiki sauce. As it turns out, grilling octopus isn’t that hard. Separating the legs and quartering the trunk takes seconds. And tossing it on the grill for a couple minutes per side is the epitome of easy cooking. The trick is to know what to expect out of the octopus. First, when you buy a two and a half pound octopus, there’s no waste. You now have two and a half pounds of meat. Second, even after the octopus has been stripped of its outer skin (something your fish monger should do for you) and rinsed before cooking, the bugger retains a good bit of salinity. This isn’t a big deal, really. The meat offers a slight taste of the ocean, which is nice when you’re eating seafood. But you need to account for the slightly salty flavor by decreasing the amount of salt you add to the tzatiki (unless you buy it pre-made) and not adding any additional salt before or during cooking. A little lemon and olive oil and you’re good to go. Third, grilling the octopus tenderizes the meat quite a bit, but it’s best to cut the oct opus into bite-size pieces (like you would calamari) after grilling. If you want to go all Greek, replace the flour tacos with flat bread or pita. However, I find that the flavor and texture of flour taco shells are a great compliment to any seafood you cook on the grill. To round out the meal, you could pick up a bottle of Greek white wine. Served chilled, these semi-dry crisp wines would work well with the octopus. 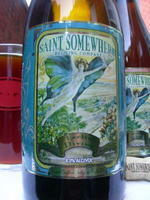 Better yet, you could pick up a couple Saint Somewhere beers, brewed in Tarpon Springs, Fla., one of America's largest Greek communities. Is this a naked plug for a brewery from my hometown (Go Rays!)? Sure, but the beer is quite good. I picked up a bottle of the Saison Athene and Lectio Divina at D’Vines in Columbia Heights. Saint Somewhere’s Lectio Divina, an abbey style ale, was good, but the saison was outstanding and matched perfectly with the octopus tacos. As a matter of fact, the pairing was downright inspired. Southern Maryland Seafood Co. Inc. I made my own tzatiki sauce, but feel free to buy it. I just can't find a container of it I like as well as my own. If you do buy it, doctor it up with the fresh oregano, lemon zest (as described below) and a diced English cucumber. If you make the tzatik i sauce, take care of it the day before. Combine the yogurt, olive oil, lemon zest and juice, garlic, salt and black pepper in a bowl. Cover the bowl and refrigerate it until you need it. When you're ready to serve, mix in the cucumber, oregano and dill. 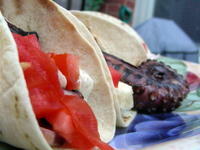 For the octopus tacos, light your charcoal or preheat your gas grill to high. Remove the taco shells from their packaging and wrap the stack in aluminum foil so they can warm on the grill. Using a sharp knife, remove the legs of the octopus from its body, but leave them whole. Cut the body into four pieces. Rinse the octopus pieces and pat dry. When the grill is ready, oil the grates to prevent sticking. Place the octopus on the hottest parts of the grill. Brush with olive oil and squeeze some lemon over top. Stick the aluminum foil packet of taco shells off to the side of the grill. After 4 to 6 minutes the octopus should begin to char. Turn the pieces over, brush with more olive oil and squeeze more lemon. Grill for another 4 to 6 minutes and remove. When the octopus comes off the grill, so too should the taco shells. On a cutting board, cut the octopus into bite-size pieces. To assemble the tacos, spoon some of the tzatiki sauce onto the warmed flour shells, add the octopus pieces and tomatoes, and squeeze some fresh lemon on it all. Cooking is like any other passion - you do it for a while, you challenge yourself, read as much as you can and with a lot of practice, you succeed. Your omelets are fluffy, sauces are creamy, steak is the perfect shade of pink. But every once in a while, like after you’ve made a crispy batch of bacon, and it’s waiting to accompany lettuce and tomato on sour dough bread, you make your own mayonnaise. And your confidence is knocked down a few notches. Like they say in fishing, mayonnaise is all in the wrist. Following an old Paul Prudhomme recipe, I whisked four egg yolks for what seemed like forever, waiting for them to foam. Not so much. I took a break, wiped sweat off my brow and tried again. Ok so maybe I needed to try adding the next few ingredients, and maybe the volume would give me more to whisk, and maybe that would help the thickening, foaming process that was definitely not happening in my bowl. The last resort? Stick the bowl full of egg, lemon, salt, pepper and oil in the fridge and see if it just needs to chill out, kinda like me at the moment. So it’s with a large bowl of yellow goop that I open another cookbook, written by the women that some people consider the authority on mayonnaise (and plenty of other recipes I’ve yet to master), Julia Child. God bless Julia and her recipe, Mayonnaise in the Food Processor. “Certainly the easiest way to make mayonnaise,” she writes. At this point, I’m welcoming easy with open arms, and tired wrists. 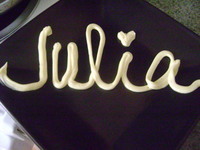 The recipe below yielded around two cups of yellow, mellow, creamy mayo with little effort and only a few ingredients. Tip: have each ingredient prepared and measured, ready to be poured into the processor at the appropriate time. The mayo will thicken in the processor quickly, and you want to be ready to add ingredients as it’s happening. Add egg, yolks, mustard and salt into the food processor and blend for 30 seconds. Add lemon juice, blend for another 30 seconds. In a very thin stream, start pouring your oil into the mixture as it’s blending. Add all the oil this way. When you’re done, stop the processor, open and check the consistency and taste of your mayonnaise. My consistency was perfect at this point, but it needed a little more salt and lemon. Let the mayo chill in the refrigerator for at least half an hour before serving. In these harsh economic times, decadence gets put on the backburner. But what happens when these harsh economic times makes decadence affordable? A few weeks ago, I came across a New York Times article reporting that the price of lobster was down because budget-conscious seafood lovers were opting for fish sticks, making the crustacean not nearly as decadent a treat. So what to do? Why go buy lobsters of course. That’s what I did last weekend. With visions of grilled lobster dancing in my head, I headed down to the wharf on Main Avenue. If you’ve never wandered down there, you’ve been missing out. Even vegetarians can fall in love with the hustle and bustle of the open-air seafood market. True, the boats that the fish mongers work on haven’t left the dock in decades, but the place looks, sounds and smells authentic. After a bit of haggling with the guys at Captain White’s Seafood City, I picked up pound-and-a-half live lobsters for less than $20 each. In fact, I picked up 15 of them. I wasn’t the only one who wanted to take advantage of the suddenly affordable lobsters. When cooking lobsters on the grill, there are really two ways to do it – split them in half or leave them whole. Seeing that I was doing Caribbean grilled lobsters, splitting them was the only option. The first time I had grilled lobsters was on my honeymoon in St. Barths. On our last evening on the island, my wife and I ate dinner at the small beach-side restaurant, La Langouste: the lobster. I ordered a rather delicate lobster and puff pastry dish. It was adorable. My wife ordered a two pound rock lobster she picked out herself. It was emasculating. To prove to us the lobster was fresh (apparently, watching it crawl around the tank minutes before wasn’t enough), the restaurant’s owner carried it over to the table and flicked it on the head, causing the startled crustacean snap to attention. Her grilled lobster was absolutely delicious. Split in two, so the meat could roast directly on the grill, the lobster tasted smoky, buttery and incredibly sweet. For the record, the two and a half pound grilled lobster I had the first night we arrived on the island was just as good. My goal last weekend was to recreate this experience. Although I was using Canadian lobsters, the effect was the same. This big difference was that in order to eat my lobster, I had to kill the poor bugger first. When faced with this, you can either parboil the lobster for two minutes in a covered pot before splitting it, or you can plunge a knife into its head and kill it instantly. I did the latter. I figured that if I was going to revel in its meat, I should look it in its little doll-like black eyes and kill it. And for what it’s worth, by the time you kill and halve the sixth or seventh lobster, you don’t even think about it. Once the gory business is done, grilling lobster is really pretty easy. Brush the meat with butter and grill meat-side down for a few minutes. Flip, brush with basil-infused butter for a few more minutes and you're done. Now, sit back, turn on CNBC, watch your 401(k) disappear, and enjoy the lobster. Remember, it’s not decadent. We can’t afford decadent. But we can afford grilled lobster. For the salad, prep the ingredients and combine in a large bowl. For the lobsters, preheat the grill to high. If using lobster tails, cut them in half lengthwise with kitchen scissors or a sharp, heavy knife; use a fork to remove the intestinal vein running the length of the tail. If using live lobsters, keep the rubber bands on the claws and kill each by inserting a sharp knife in the back of the head between the eyes; this will dispatch them instantly. However, this is messy business, so do this outside, or lay down newspapers or something else to absorb the liquid from the lobster. Cut the lobsters in half lengthwise and remove the vein and the papery gray sac from the head. Break off the claws, remove the rubber bands and crack with a nutcracker. Brush the cut sides of the lobster tails or lobsters with some of the melted butter and season with salt and pepper. Add the chopped basil to the remaining butter. When ready to cook, oil the grill grate. 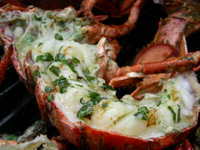 Arrange the tails and lobster halves and claws (if any), cut sides down, on the hot grate and grill for 6 to 8 minutes. Turn, using tongs, and grill on the shell sides until the flesh is firm and white, 6 to 8 minutes more, squeezing lime juice over the lobsters as they cook and brush generously several times with the basil butter. Transfer the lobsters to serving plate or a platter and serve immediately, accompanied by the remaining basil butter in ramekins on the side. Heard around the DC Foodies blogosphere this week...A little birdie told me is an apt way to describe the revealing piece that Jason Wilson wrote in the Washington Post this week about D.C.'s new clandestine and movable drinking establishment, Hummingbird to Mars. Some might apply the Ecclesiastes 10:20 derivation of the phrase "for a bird of the air shall carry the voice, and that which has wings shall tell the matter". Others might say that the Dutch Er lif t'el baerd, meaning "I shall betray another" is the shoe that fits. You can read more reader thoughts on Wilson's article here at the Free Range on Food chat (where Wilson was a guest and responded), and Don Rockwell. 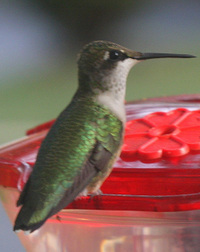 For more on the Hummingbird to Mars experience, read Metrocurean's blog entry here. Fish gotta swim, birds gotta fly, and journalist have to...abide by rules, or write the (whole) story? Tell DC Foodies what you think. D.C. food writer Monica Bhide (A Life of Spice) probed what is good about eating animal fat with author Jennifer McLagen for Salon.com. The article, entitled Why You Shoud Eat Fat (I like it already), tells readers how delicious and much maligned animal products can be used for homemade meals that are not as time and cost involved as one would think. And best of all, eating animal fat does not necessarily cause waistline expansion. Bone marrow tacos, anyone? Speaking of expansion, two restaurants made some buzz this week with plans to open additions. First, Michael Landrum of Ray's (insert restaurant here) will be adding Ray's the Net to his restaurant family. In keeping with his them of approachable and affordable food, Landrum told the Washingtonian that he will present seafood as simply, freshly and cheaply as possible. See the Best Bites Blog for more detail on Landrum's plans. Second, Cafe Pizzaiolo in Crystal City is opening a second location in Del Ray. Food boards are reporting that the new location will be in the Calvert Buiding on Mount Vernon Avenue, adding to the spicy Bombay Curry Company and simple southern cuisine at Del Merei Grill. Cafe Pizzaiolo has been noted as one of the best places for pizza in the D.C. area, and made the 2008 Cheap Eats list in the Washingtonian magazine. Dining out for a cause is always a good reason to get out of the kitchen and enjoy good food. This week, Capital Spice tells readers about A Literary Feast, where you can attend one of over 30 literary-themed dinners, hosted by Hill residents. The dinners are inspired by the book's story, setting and food. The event is held October 25th and benefits the DC Arts and Humanities Education Collaborative. In Alexandria, The Houndstooth Gourmet tells readers about Dine Out and Shop in Alexandria for the Walk to Fight Breast Cancer. Alexandria restaurants including Taqueria Poblano and Southside 815, and shops such as Let's Meat on the Avenue will be donating part of their proceeds on October 21st. 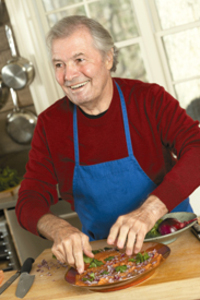 Seasoned chefs, beginners and even those afraid of the big bad stove can appreciate Jacques Pepin – his style caters to anyone who loves food. Attendees can look forward to video clips from the new series, a conversation about Pepin’s culinary career and a book signing. Tickets are $28 (for general admission, resident members are $18) and can be purchased online. 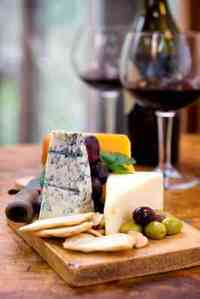 When it comes to cheese pairings, most of us automatically reach for wine. It's hard to deny the complementary effects that wine and cheese have on each other, and the idea is reinforced throughout the media. But wine is not the only adult beverage that can be paired with cheese, and the folks at Sova Espresso & Wine are hosting an event tomorrow evening that will demonstrate just how well beer and cheese can go together. They will be pairing five distinctly different cheeses with five complementary beers as part of the Atlas District's First Thursday celebration on H Street, NE on Oct 2nd. The event will run from 7 to 9 PM, and it costs $25 per person. The tasting is being conducted by Jessica Wurwarg, a teacher at that cheese-lover's Mecca, Artisanal. I had a chance to speak with Jessica, and she informed me that beer and cheese pairing events are a growing trend that can be attributed to the natural relationship that exists between the two fermented products. "While wine and cheese can be either super-delicious together or the other extreme, beer and cheese are more easy-going." Unlike wine and cheese pairings, which are often chosen for their contrasting yet complementary flavors, beers are most often paired with cheeses that offer similar characteristics. The effervescence of the beer can cut through the fat in the cheese to allow a greater appreciation of its flavors - hence the need for a beer that won't clash with the cheese. An example is the pairing of a sharp cheddar cheese with a crisp IPA - a situation where both are dry and tight on the tongue. 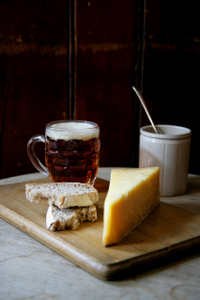 Wurwarg warned that the main thing to keep in mind when pairing beer and cheese is to seek balance - don't let a heavy beer like a porter overpower a lighter, milder cheese. The hardest pairings, she said, were for cheeses with complex flavors - washed-rinds and blues are particularly difficult to pair, but guests can expect one such pairing at Thursday's event. Other likely pairings include a lighter goat cheese with a fruitier Belgian beer and a sheep's milk cheese paired with an amber ale. First Thursdays are an opportunity for the bars, restaurants and entertainment venues of the Atlas District to showcase their own interpretations of specific themes. This month - surprise, surprise - the theme is Oktoberfest, which inspired Sova owner Frank Hankins to put together this beer and cheese event. Other venues' offerings include German specials and 'traditional Oktoberfest clothing' at Granville Moore's, a Beer & Brat special at the Argonaut, $3 Harpoon Oktoberfest beer at the Red and the Black, and $1 wursts (while they last) at the H Street Martini Lounge. These evenings occur monthly, and each month brings a new theme. Although this end of H Street is not served by the Metro, there is ample parking in the surrounding neighborhood. But if you're coming for a beer tasting, you might consider picking up a cab at Union Station or riding the X2 bus line to avoid the need to drive home. 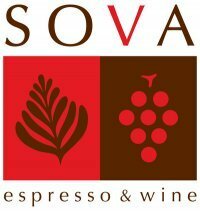 Sova has been open on H Street since the end of last year, and Hankins has been slowly but steadily developing it into exactly the kind of place he first envisioned. A relaxed neighborhood coffeeshop serving quality Intelligentsia coffee and espresso on the ground floor shares space upstairs with a laid-back wine bar featuring ten or twelve wines by the glass that go beyond the usual cabernet, pinot noir, and sauvignon blanc. His latest addition is a range of gourmet panini and salads. Sova is located at 1359 H Street, NE.